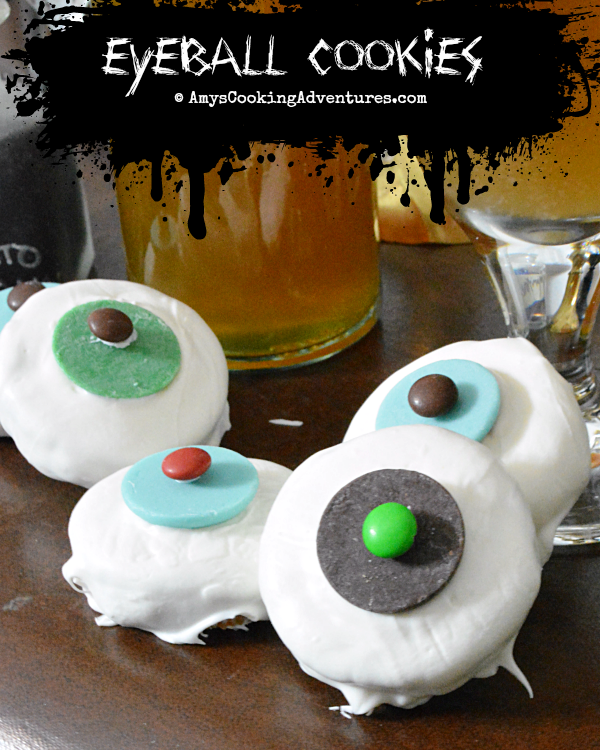 Eyeball Cookies - A spooky Halloween treat everyone will enjoy! It’s time for the Halloween edition of Food ‘n Flix! In Food ‘n Flix, bloggers watch the selected movie for the month, then head to the kitchen to whip up something inspired by the movie! Any blogger can join in the fun, just click the link to find out more! 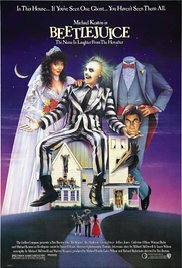 This month’s film was Beetlejuice, hosted by Deb at Kahakai Kitchen. I think I saw part of Beetlejuice, once, ages ago, but I barely remembered it, so it was time to watch it with foodie goggles on. I’m sure most of you have already seen this movie at one time or another, so I won’t spend a ton of time on a synopsis, especially since this movie was really not my cup of tea. You guys, I’m reeeeeally not into super Halloweeny or spooky movies. Like, at all. My idea of a Halloween movie is It’s the Great Pumpkin Charlie Brown, or the Harry Potter series. So, I finally got around to watching Beetlejuice (Hubs was right, it wasn’t scary! )…and I fell asleep half way through (I had had a ridiculously long week!!) Thankfully, I only missed 5-10 minutes of the movie and still had enough inspiration for my recipe! After the scene when the Maitlands pull out their eyes to scare the Deetz family, I remembered some eyeball cookies I was eyeing (hehehe) when searching for a recipe for last week’s Taste of Home Tuesday inspiration. I ended up passing on the cookies that time, but they were perfect for Beetlejuice! I love when things work out! Take a look at the rest of the yumminess from Taste of Home Tuesday! And keep an eye out for the Food ‘n Flix recipe round up, coming soon! Line a baking sheet with parchment, waxed paper, or a silicone baking mat. Dip the Oreos into the melted candy melts, allowing the excess candy to dip off. Place the cookies onto the prepared surface and immediately place 1 colored candy melt in the center. Repeat until the remaining cookies/candy melts are used up. Use a little of the leftover melted candy to stick the M&Ms to the center of each eye. If desired, use red food coloring to draw lines on the eyes. What a fun treat! And so easy! Even though we are a family of adults, what a fun surprise for their lunches! These are so cute and easy too! What a fun way to get kids in the kitchen. 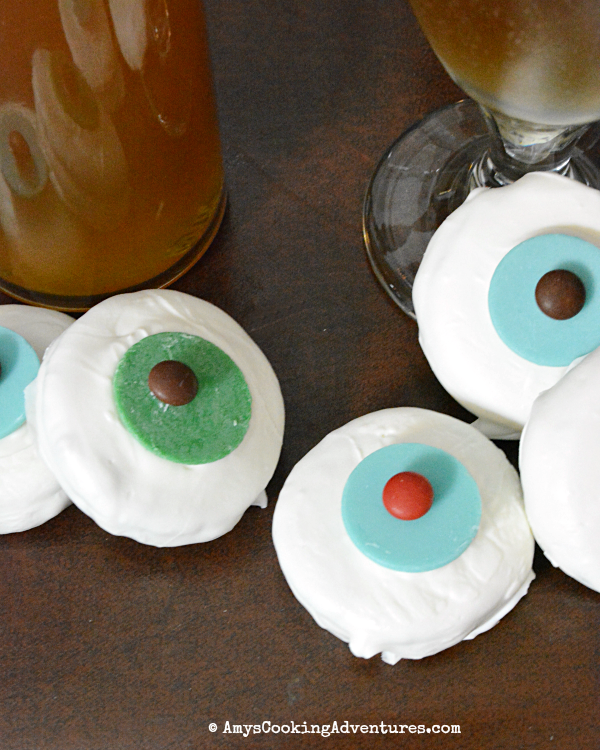 These cookies are so cute - and the eyeballs are awesome inspiration! What fun cookies and so much cuter than the Maitland's eyeballs Amy! ;-) I am sorry you didn't enjoy the movie more, but at least you ended up with a great little Halloween treat inspired by it. These are adorable Amy....I'm not a fan of scary movies either so I completely get you. What a cute idea! This seems fun to do with kids for Halloween as well. Fun fun recipe! I love the different colors!